WASHINGTON (Reuters) — Coffee and tea may reduce the risk of serious liver damage in people who drink alcohol too much, are overweight, or have too much iron in the blood. This article was on CNN Online News. When I read it, I remember I wrote a similar article 35 years ago. 85 years ago, many Japanese immigrated, seeking for green pasture to Brazil, Bolivia, and Mexico as coffee planters. Of course, their main drinks were coffee and tea. We leaned that most of them including their native workers never suffered from liver problems. My study and survey continued and found out that there may be some important role in coffee (not instant coffee) to prevent diseases or liver problem. Me and my family drink a lot of green tea and coffee (not instant coffee) daily. We do not drink carbonated beverages at all. Coffee can counteract alcohol's poisonous effects on the liver and prevent cirrhosis and liver cancer. One cup of coffee a day cut the risk of alcoholic cirrhosis by 20 percent. 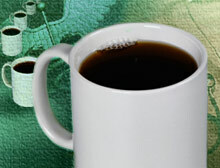 Four cups of coffee a day reduce the risk of alcoholic cirrhosis by 80 percent. Although it requires some more investigation but we believe that it is the caffeine that provides the protection. Of course, the best way to avoid getting cirrhosis is not to drink a lot of coffee, but to cut down on the drinking of alcohol. The same study found that coffee drinkers had healthier results on blood tests used to measure liver function. Coffee's effect on reducing liver enzymes in the blood was more apparent among the heavy drinkers in the study.